As I write, I’m sipping a bottle of Weninger’s 2002 Veratina. It’s a reasonably high-end Austrian red. Dark fruits dominate, with a roasted, tarry edge and lots of freshness from the relatively high acidity. 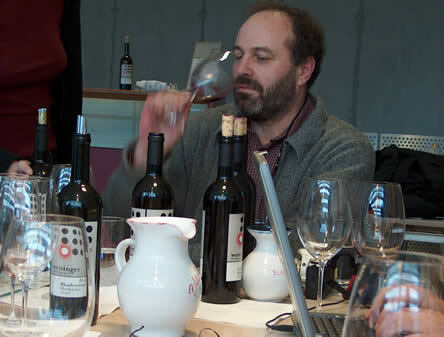 The Weninger reds are among Austria’s best (pictured right is Franz Weninger tasting his wines). They are quite modern in style, but they retain a sense of place and are highly food compatible. This is a wine that, while it’s drinkable now, is saving its best for last – or at least another five years. When it comes to deciding what wines to drink, I’m often at a loss. I’ve got a reasonable stash of wines at home, but frequently I find it incredibly difficult to decide what wine to drink to match my mood on a particular occasion. I find it much easier to buy wine than to drink it. Tonight, I tried a tactic I occasionally employ. I ask Fiona to randomly select a bottle for me from my stash. A relatively risky strategy, this, because there are some smart bottles mixed in among the everyday stuff. But it’s precisely these smart bottles I can never find the right occasion to drink. The Veratina is beginning to open out a bit on the nose, as wines often do shortly after uncorking. There’s a gentle herbiness to the fruit, which is becoming more defined, towards the cherry and red fruits end of the spectrum. On opening, it was more dark fruits and roasted coffee. The fact that wines do change in contact with air means that critics have to be careful: you can have less confidence in a tasting where you are giving wines a quick sniff than you can in judgments forged over lunch, dinner or casual reflection. This wine is now much more elegant than it was just after it was opened. Our sensory apparatus – and the subsequent processing machinery of the brain – is relatively imprecise when it comes to flavour. This doesn’t meant that we can’t make reliable judgments; just that we have to think a bit about what we are doing, and be humble enough to know that we can make mistakes relatively easily. Having said this, I’m confident that I do have a bit of a knack for tasting wine and getting it ‘right’ (whatever that means). If I didn’t think this, then I’d just give up and do something else. I don’t want to be one of those wine writers who tries to stick their finger in the air before nailing my colours to the mast (don’t you just love that mixed metaphor, folks? ); I’m happy to go out on my own. In writing this I’m recognizing that there are different cultures of wine (there still exist people who quite genuinely are horrified by the fact that the Australians are making wine, or by the sight of the grape variety on the label), and that there exist individual differences in perception that can render, for you, one critic useless and another spot on. Another glass of the Veratina is poured. Franz Weninger named this after his two daughters. It must be great to be the offspring of the owner of a wine estate, if, that is you have an interest in wine (and if the estate is any good). If you were relatively able and got on with your folks, you might be the possessor of a dream job. But you’d have to really want to do it, or life could be hell. Perhaps its healthiest to move on, do something else, and then if you decide you’d like to, come back to the family business. Talking about families, regular readers of wineanorak might wonder why I seldom mention my kids. I have two boys, both under 10. It’s not because I’m not a devoted family man. It’s because in this day and age it is sadly inadvisable to put pictures of your kids, or their names, on a visible website like this; this problem is compounded by the fact that our boys have been adopted. Much as I’d like to put family pictures up on the website to convince you how wonderful the Goode family is, it would be inappropriate and possibly risky. Besides, as an old friend used to say – kids are like farts: you don’t mind your own, but you can’t stand other peoples’. There’s some truth in this, so I’m doing you a favour by sparing you the family photos. So I return once more to Veratina. [Sounds like a line from Brideshead Revisited.] Now it’s dark, sweet, chocolatey and intoxicating. It’s deep, and drawing me further in, like a good wine should. A wine should invite the drinker into a higher experience; not changing the identity of the reality, but just opening it out with a subtly shifted perspective. Wine works best not as an end in itself, but as an accompaniment to thought or experience. In this case it is a little like music. Each of us has a soundtrack to our lives – for some who listen to a lot of music, this is more significant than others – whereby the tunes that fill our mental space form the backdrop to our experiences. An aural anchor to reality, that then is enmeshed in our memory with those very experiences, and acts as a key to unlock the emotions that accompanied them. If anything, tastes and smells have a stronger ability to do this. Wine rocks!